Yesterday, President Trump announced that the United States is withdrawing from Obama’s disastrous Paris climate accord. The President’s action marks another important campaign promise fulfilled, and it also marks the end of one of Obama’s most corrupt acts as President. While Obama and his liberal allies from Hollywood to Silicon Valley to Wall Street claim that the goal of the treaty was to reduce so-called greenhouse gasses, its effect was to produce a massive wealth transfer from American workers to foreigners and wealthy investors. And the end of that wealth transfer is what drives the howls emanating from Wall Street and Silicon Valley. For example, according to The Los Angeles Times, Obama crony Elon Musk received some $4.9 billion in taxpayer subsidies for Tesla, SolarCity and SpaceX. Our friends at the Taxpayers Protection Alliance (TPA) claim that, “American taxpayers spent an average of $39 billion a year over the past 5 years financing grants, subsidizing tax credits, guaranteeing loans, bailing out failed solar energy boondoggles.” According to one estimate by the Los Angeles Times, state and federal subsidies to Musk’s SolarCity have eclipsed the $1.5 billion mark. Meanwhile, less than one percent of the electricity used by Americans comes from solar energy sources. Another report released by TPA details SolarCity’s financial House of Cards, “SolarCity reported a net loss of $141 million for the 4th quarter of 2014, despite a 52 percent increase in revenue, strong demand, and clear dominance in the rooftop solar market." Instead of giving up his subsidies Musk has resigned from President Trump’s advisory committees. Likewise, when Goldman Sachs Goldman CEO Lloyd Blankfein sent his first-ever tweet on Thursday -- he used it to criticize President Trump's decision to back out of the Paris climate pact. "Today's decision is a setback for the environment and for the U.S.'s leadership position in the world. #ParisAgreement," he said. Blankfein’s tweet probably had nothing to do with the fact that Goldman Sachs Alternative Energy Group is a major player in the green energy field that Obama’s policies created through government fiat. And Goldman Sachs Alternative Energy Group, and similar plays by other big Wall Street firms, are the nexus between Wall Street support for the Paris climate accord and anger over Trump’s decision to take America out of the deal. To meet the goals of the Paris Agreement, the U.S. would have to make major investments in renewable energy, energy efficiency, and cleaner motor vehicles. This likely explains why the Paris climate deal was so popular with many in Silicon Valley and many on Wall Street. The Paris agreement promised a bonanza of taxpayer subsidized spending and investment for Obama cronies who promote technologies that wouldn’t otherwise be attractive. It virtually guaranteed government action making self-driving, solar powered cars and other Silicon Valley dream technologies mandatory. It isn’t that Wall Street wants to save the planet, it’s that Wall Street wants the government to force Americans to guarantee them a profit on their alternative energy investments by implementing policies that require consumers to subsidize uneconomic alternative energy investments, like Musk’s Solar City. And it is American workers and consumers who would have paid, had President Trump kept us in the Paris agreement. A Heritage Foundation study found that the Paris agreement would increase the electricity costs of an American family of four by between 13 percent and 20 percent annually. It forecast a loss of income of $20,000 of lost income by 2035. In other words, American families would be paying more while making less. The overall effect of the agreement would reduce U.S. GDP by over $2.5 trillion and eliminate 400,000 jobs by 2035, according to Heritage’s study. This would exacerbate problems with government funding and deficits, make Social Security solvency more challenging, and increase reliance on government’s spending to support households, noted Breitbart’s John Carney. However, what was even worse than Obama’s forced wealth transfer from American workers and consumers to his green energy cronies, like Elon Musk and Goldman Sachs Goldman CEO Lloyd Blankfein, was the taxpayer subsidies promised to foreign governments. So far, the United States has given the Green Climate Fund $1 billion. President Barack Obama pledged a total of $3 billion to the fund by 2020 as part of a global goal of $10 billion, but during the campaign President Trump promised not to fund it and Congress has not made further contributions since the election. The Obama commitment, by the way, doubled what other countries had previously pledged, yet there was no similar commitment to help American workers in the coal and other industries targeted for extinction by Obama, Hillary Clinton and their wealthy cronies. And the industrial carnage would have targeted the very people who put Donald Trump in the White House. The industrial carnage caused by meeting the Paris agreement targets would have been concentrated on four states, Michigan, Missouri, Pennsylvania, and Ohio, according to a Chamber of Commerce study. Michigan’s GDP would shrink by 0.8 percent and employment would contract by 74,000 jobs. Missouri’s GDP would shrink by 1 percent. Ohio’s GDP would contract 1.2 percent. Pennsylvania’s GDP would decline by 1.8 percent and the state would lose 140,000 jobs. During the campaign candidate Donald Trump promised to make America great again and to make Americans rich again. 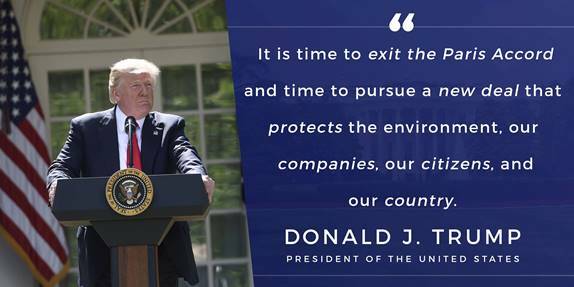 By taking America out of Obama’s corrupt, unconstitutional, job-killing, wealth redistributing Paris climate deal the President has taken a major step to fulfill that promise.